After shelling the fava beans (broad beans), pour boiling water over them and when the water has cooled, slip off the outer skin which will reveal the beautiful inner bean in two halves. Place in a bowl. 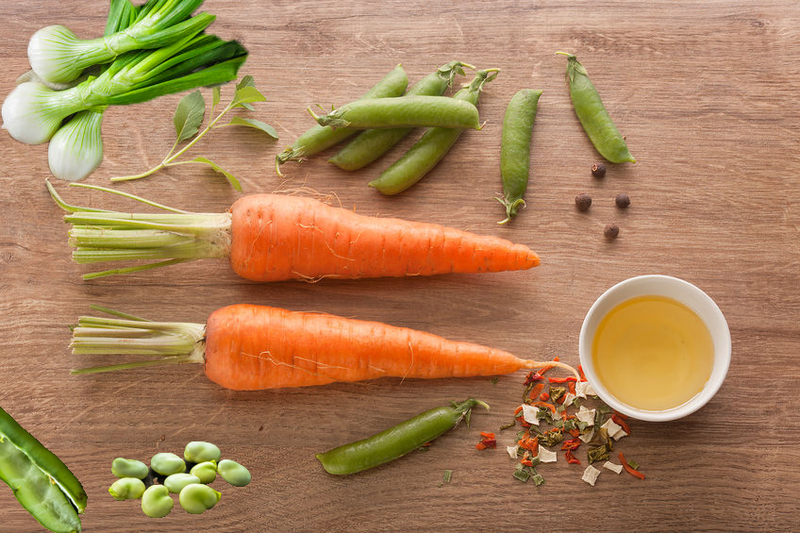 Place the carrots in a steamer and steam them for exactly 4 minutes, then add the spring onion bulbs and the peas and continue to steam for another 3-4 minutes. Prepare the vinaigrette by placing all the ingredients in a jar with a tight lid and shaking to combine or use a hand blender to blend all the ingredients together. When the vegetables are tender but still have a little bite, remove the steamer, pour out the water and put the fava beans in the pan along with the rest of the vegetables. Pour in the dressing and toss together until everything is well-coated. Pour into a warmed serving dish and garnish with herbs.